I’ve always had a curious affinity for the tops of resupply cabinets. Whether it’s during my weekly quasi-idle sessions in Offline Training, or at the tail end of some test or other conducted to investigate weapon properties, I find myself gravitating toward the nearest one, hauling myself onto it, and engaging in highly meaningful activities along the lines of “see how many times you can shoot the cabinet before the old bullet holes disappear” or “make smiley face patterns with melee hits :)”. But, like many illustrious scientists in history — to whom I am entirely comparable — I’ve encountered useful or amusing things in the course of fooling about. Among these was the personal discovery (not, I’ll wager, unique) that some apparently isolated resupply cabinets in fact did not require that I switch to an advanced mobility class in order to scale them. 2Gorge is my go-to Offline map, of course. The alarm pictured to the right of that screenshot is a solid object to players and can be stood on or slid over. A crouch-jump and scrabble onto the large gas canister in the corner will put you at the perfect height to spring another crouch-jump onto the alarm. Holding crouch and forward will allow you to surf off the alarm and land on the resupply cabinet as any normal-speed, normal-mobility class — no explosions, double jumps, or extra speed necessary — while releasing forward at the right moment will allow you to perch on the alarm and survey your lowly teammate peons from a fittingly elevated vantage. There’s two ways to get on the back right resupply cabinet in Upward’s first BLU spawn, one which requires a proper crouch-jump and the other which is made easier by such. The former is a direct leap from the short railing above the bench onto the lockers, which puts you pretty much on the same plane as the top of the resupply. You cannot make this jump from a standstill — use the minuscule width of the railing to give yourself a running start. The former can be done from a standstill and without crouch-jumping, if you position yourself correctly, but there’s really no benefit to limiting yourself that way. Simply crouch-jump onto the top of the blackboard and proceed logically from there. Now what on earth is the point of mucking about in spawn like this, anyway? Well, the purpose is twofold. First, you’ll notice that these are both starting BLU spawns for maps with setup time. As a normal-mobility class — i.e., not Medic — it isn’t as if one has anything else to do for sixtysome seconds. Even were one to play Spy, it wouldn’t take all that long to check the opposing Medic’s (or Medics’) Medigun(s), unless RED has an unconscionable number of them, and there’s no buildable areas accessible to the Engineer. That brings us nicely to the second point: though no one’s going to be pulling off any airpogos as Sniper or writing home about their groundbreaking Flare + Homewrecker Pyro rollouts, every class can benefit from steadier footwork. Particularly classes with no advanced mobility. 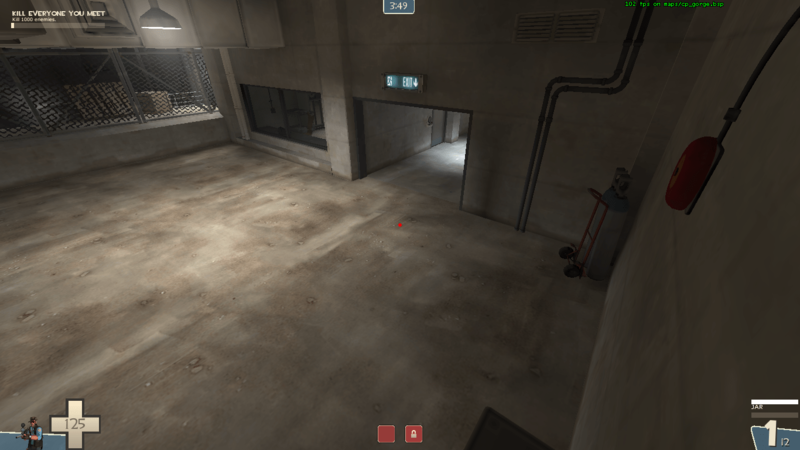 After all, a Demo can easily jump onto Gravelpit C without bothering a great deal about precision, but what if I’m a Spy or some such and there are only ten seconds left on the clock? By the time I make the trek all the way from the tower base, my time will be up. Familiarizing myself with long-jumping as a normal-mobility class opens up a world of shortcuts, and the more I practice, the more reliable those shortcuts will be. A Scout has a second jump to catch them when they misstep (and sometimes a third… or fourth, or fifth) — an Engineer has no such luxury. Soldiers have 200+ health and Gunboats to eat their explosive self-damage where Det Pyros and wrangling Engineers may not be able to afford it, and a fleeing Medic has the advantage over a fleeing Sniper on speed alone. Now, there’s nothing wrong with spending setup time hitting teammates with your Frying Pan if that’s how you roll, but for those who might enjoy widening their repertoire of movement on classes generally considered slow and earthbound, it’s a free sixtysome seconds for you to bounce around the spawn room, exploring map objects and practicing your jumps. 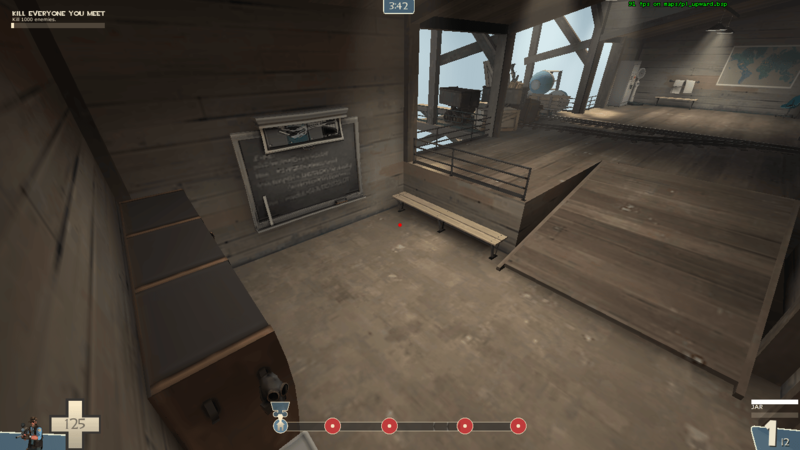 Keep an open mind, flexible fingers, and an explorational sense of curiosity throughout the map during more casual games, and and you’ll see that the boring old 100% movespeed normal jump is not as limited as you might imagine. Fighting Back against those Metal Bastards!